FRANKLIN, Mass. – When you are struggling to get into a rhythm offensively and everyone is grabbing the stick a little tighter, it takes players grinding in the corners and making the effort to get to the front of the net to turn things around. After watching Oliver Ames tie the game early in the third period of Wednesday night’s league opener at Pirelli Veterans Arena, Franklin needed a little inspiration to avoid extending its winless streak to six games (0-3-2 after opening the season with an exclusion win against Malden Catholic). Up stepped senior forward Joe Lizotte. Despite being the only Panther in the offensive zone, Lizotte managed to hold possession in the corner against three OA defensemen. He squeezed the puck out to the right boards where it kicked to Tom Tasker, who sent a puck across the crease. The puck was deflected by C.J. Spillane, and several bodies in front of goal, to the far post and Zac Falvey popped up to knock the loose puck into the back of the net. It was the spark that the Panthers needed. Franklin scored again three minutes later to seal a 4-2 victory and kick off its league title defense with a much-needed two points. Franklin came out strong in the first period, holding a 9-3 edge in shots after the first, despite giving up a power play only 50 seconds into the game. 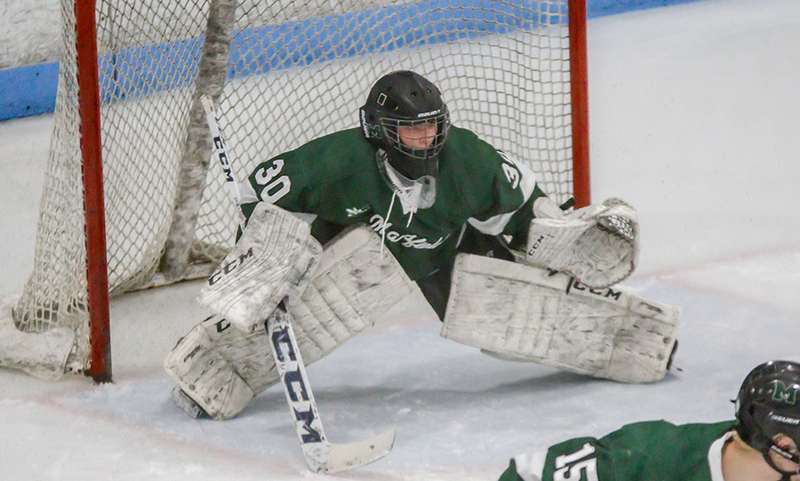 Sophomore Declan Lovett had a good look from the dot that he sent just wide and the puck bounced out to Cam Cassella at the point, who forced a save from OA goalie Owen Connor (26 saves). Lizotte forced a save from the left circle and then Spillane and Tasker put shots on goal only to be denied. OA’s best chance of the opening period came with just under six minutes left. Jake Gottwald slipped a pass into the slot where Ross Carroll put a shot on net only to have Panthers goalie Ryan Cameron (10 saves) kicked it aside. The hosts nearly took the lead with just seconds left in the first but Tasker’s shot came back off the post. The Tigers started the second on the power play and needed only 19 seconds to make it count. Following a Connor save, Brett Williams broke down the right side and was able to play the puck across the crease into defenseman Matt McCormack, who forced a save from Cameron, and Cullen Gallagher was on hand to tap in the rebound. Unfortunately for the Tigers, Gallagher was injured not long after the goal and forced to leave the game, one of two OA forwards to get injured on Wednesday. Lizotte had a decent chance at an instant response only for Connor to make the save and then the OA goalie kept out Kyle Hedvig on a tip of a Cassella slap shot. Brendan Sicchio came close too with a shot off the post. Finally, with 7:33 left in the second, Franklin’s pressure paid off. Lizotte got behind the OA defense in the left circle and cut across goal onto his backhand before sliding it under Connor. Just seconds after Williams and Carroll had chances on the other end, the Panthers took their first lead of the night. Again it was Lizotte that created the opportunity by riding a challenge and keeping hold of the puck. It skipped behind the net to Matt Holmes, who flung a pass out to the point where Cassella fired a wrister through traffic and into the top corner. Franklin almost doubled the lead in the third when Falvey made it three posts for the Panthers, but OA answered back to tie it. Off a face-off in the attacking zone, Gottwald had a chance from the slot that Cameron saved, but the rebound was knocked out of mid-air by Colin Bourne and slammed into the back of the net. Williams almost gave the Tigers the lead but Cameron made a sprawling save. It was one of the few times that OA managed to get in behind the Franklin defensemen. With 8:49 left, after Lizotte’s effort in the corner, Falvey put Franklin in the lead. Three minutes later, the Panthers sealed the win. Dan Magazu threw a puck in front from the right boards and Shane McCaffery managed to squeeze the tip under Connor’s pads for a 4-2 lead. Freshman Bryan Kearns had one more good chance for the Tigers but his shot was kicked out by Cameron and the Panthers got their first two points (for MIAA purposes) of the season. Franklin (2-3-2) will travel to Taunton on Saturday, while Oliver Ames (5-3) will look to bounce back when it hosts Foxboro. Franklin, 3 @ Malden Catholic, 0 – Final – Senior Matt Holmes scored twice and senior Ryan Cameron recorded a shutout as Franklin opened up its season with a win over Malden Catholic. Cameron made 17 stops in net for the shutout while senior CJ Spillane added an empty netter in the final minutes for the Panthers. King Philip, 3 @ Oliver Ames, 0 – Final – Click here for a recap and photo gallery of this game. FRANKLIN, Mass. – Mansfield scored the first goal of the game with less than seven minutes to play in the game, but Franklin had an answer four minutes later to help the Panther steal a point in a 1-1 draw. The Hornets had a 29-25 advantage in shots, outshooting the Panthers in both the first and third periods. Despite multiple chances throughout the first and second periods, goalies Dan Sheehan (Franklin) and Sean McCafferty (Mansfield) kept the puck out of the net. But just over the midway point of the third period, Mansfield was finally able to break the stalemate. A turnover in the offensive zone allowed Mansfield to race out to a 3-on-2 chance. Coming down the right side of the ice, freshman Coleman Jenkins dropped a pass to the middle of the ice for junior Austin Ricker. Ricker fired a wrist shot up high that Sheehan (28 saves) denied at first, but the puck had enough mustard to trickle over his shoulder, bounce off his back and fall into the net to give the Hornets a 1-0 lead. The goal seemed to wake the Panthers up and they were finally able to solve McCafferty with just 2:42 left in the game. Senior Luke Downie had his pass partially blocked and the puck ended up on the stick of senior TJ Durkin. With his back to goal in the center of the ice, Durkin turned, pulled the puck back on his stick and roofed a wrist shot to tie the game. “The result reflects our performance, we did not play well,” said Franklin head coach Chris Spillane. “We didn’t skate, we didn’t win 50-50 battles, they were more physical than us…they wanted the game more than us, simple as that. We were very fortunate to get the point. After Franklin’s Jeremy Miller hit the post on a low, turn around shot just over a minute into the game, the Hornets seemed to take control of the game. Franklin had an early power play opportunity but an interference 20 seconds into the man advantage made it 4-on-4. That resulted in a quick 2-on-1 chance for the Hornets with Tim Arnold feeding Adam Anastos, but Sheehan made the save. The Hornets had another odd-man rush with Chris Copponi and Anastos got into the zone but Copponi’s shot and rebound chance were gobbled up before Anastos could pounce. On the ensuing play, Franklin came flying up ice with Miller finding Brendan O’Rielly and O’Rielly returning the pass right on front of net but just out of the reach of Miller. Mansfield went on the power play with five minutes left in the period but couldn’t covert. The Hornets had another man-advantage chance at the end of the first and 70 seconds into the second period, but couldn’t cash in. The best chance on the power play came just a minute into the second when Mansfield freshman Matt Copponi deked around a defenseman to get an open chance on goal but he couldn’t finish with little space in front. Franklin’s best stretch of the game came at the midway point of the second period when the Panthers went on the power play. Miller set up defenseman Tom Tasker for a point-blank shot that McCafferty turned away. McCafferty came up with two more huge saves on the kill to keep the game scoreless. Just after Mansfield killed the penalty, the Hornets had a golden chance. Jenkins jumped on a Franklin turnover in the offensive zone and went at goal, trying to sneak a backhand in at the near post but Sheehan kept his position and made a big pad save. With less than a minute left in the period, Copponi intercepted a Franklin pass across the blue line and raced into the offensive zone but his shot at the near post flew high. Franklin had one final chance in the period when Matt Holmes made a nifty pass with his skate to set up CJ Spillane but his shot from in close was smothered by McCafferty. The Panthers had two early chances in the third when Downie found Joe Lizotte in front but his shot went high. A minute later, Dan Magazu connected with Spillane but again McCafferty was up to the task. Each team had a chance in the final two minutes but Mansfield’s Chris Kelleher had his backhand attempt turned away and Franklin’s Lizotte had his low shot denied. Mansfield boys hockey (3-0-2 Hockomock, 5-3-3) remains in first place in the division with a one point advantage over Franklin. The Hornets host Oliver Ames on Wednesday at 7:50. Franklin (3-0-1, 8-1-3) is back in action on Wednesday with Foxboro scheduled to come to town. WOONSOCKET, R.I. – For the second time in three seasons, Franklin reached the championship game of the Mount St. Charles Holiday Face-Off at the venerable Adelard Arena and for the second time the Panthers were unable to come up with a third win in three days to claim the first place trophy. Joe Mancini of Fairfield Prep (Conn.) scored his second goal of the game with 3:37 remaining in the second overtime to give the Jesuits the 3-2 victory in a game that featured non-stop, end-to-end action right from the opening face-off. “I’m happy with the effort for sure,” said Franklin coach Chris Spillane, whose team does take home a point, as the game will be officially recorded as a 2-2 tie for MIAA purposes. “Three games in three days and all three were sort of like this; nothing was easy here. The Panthers came out flying in the first period, dictating play, winning battles in the corners on both ends of the ice, out-skating Prep, and creating a host of scoring opportunities. Franklin held a 13-7 edge in shots after the first and had each of its first three lines contribute. Junior Matt Holmes had Franklin’s first chance just two minutes into the game with a shot from the slot off a pass by T.J. Durkin that was saved by Prep goalie Jack McGee. Dan Magazu had a chance just seconds later off a Luke Downie feed but McGee gloved the shot to keep it scoreless. The Panthers broke the deadlock with 5:08 left in the first. Durkin dug out the puck from the corner and slipped it from behind the net out in front to senior Brendan O’Rielly, who pulled it across the crease to his backhand and buried the shot high to the glove side. Despite Franklin’s dominance, the Jesuits managed to create one great scoring chance with a minute to go in the period and pounced. A turnover in the attacking zone turned into a quick break and an odd-man rush for Prep, which Mancini finished off to tie the game at 1-1. There is no break in between periods, as Adelard Arena only cleans the ice in the second intermission. The teams barely had a chance to get water let alone talk things over and the new period started. Spillane admitted that it was something the Panthers had to be concerned with. The old ice worked just fine for the Jesuits. Having scored with a minute left in the first period, Prep took its first lead just a minute into the second. 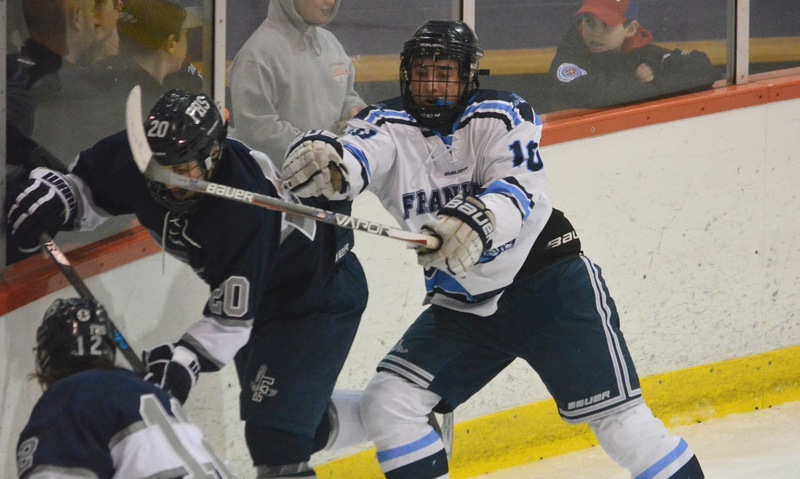 Franklin’s defense was caught pinching in at the blue line and Fairfield got another two-on-one break that Kevin Oricoli took advantage of with a snipe under the bar. The Panthers nearly tied the game three minutes later when junior Joe Lizzotte stole the puck in the neutral zone on the penalty kill and skated in for a shorthanded breakaway, but McGee was able to deny the forward at full stretch. At nearly the same time as the goal he scored in the first period, O’Rielly popped up with his second of the night to level things up. Downie was credited with the assist, although it appeared to be Magazu that was crashing the goal, when his shot was parried by McGee right to O’Rielly, who did not miss the chance. Franklin nearly grabbed the lead back early in the third period. Junior Zac Falvey skated into the high slot, nearly uncovered, and uncorked a wicked slap shot that hit the inside of the junction between post and crossbar, fell to the ice, and skidded straight across the mouth of the goal with McGee stranded. Connor Norton had a shot from the point saved just a few minutes later and the rebound fell to Falvey, but this time the junior’s flicked backhand somehow looped narrowly above the bar. After being just an inch away from the lead, the Panthers started to fade and Prep started to take control of play. The Jesuits held a 10-5 edge in shots in the third and put increasing pressure on Franklin goalie Owen Ginley (36 saves). The senior netminder came through with a series of solid stops including a glove save to rob Mancini with a few minutes left. Prep continued the momentum into overtime and Ginley was called on for another spectacular stop with just three seconds left, going post-to-post to get a pad on a Ryan Eckert shot after a saucer pass across the crease by Mancini. It was Mancini that knocked in the winner during the 4-on-4 second overtime. The Panthers lost the puck in the defensive zone and the puck was played across the goal to Mancini and he scored with a one-time to win the title. “That last goal, it was a nice smart play by their forward to give it to the open guy, they caught us in a change, and we were gassed,” Spillane explained. Franklin beat LaSalle College (Pa.) and Bishop Guertin (R.I.) to reach the final game. 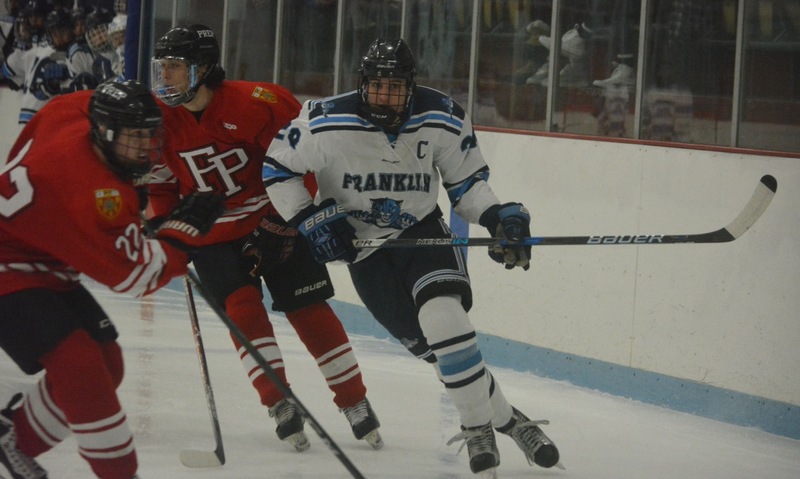 A lot has been made of the Panthers being the lone public school program in the eight-team field, but Spillane played down the importance of representing public school hockey. Franklin (5-1-1) will get a week break before getting back on the ice to open Hockomock League play against Stoughton on Jan. 6. BUZZARDS BAY, Mass. – There will be a new Division 1 state champion this winter, as Franklin hockey saw its title defense come to a close on Sunday afternoon at Gallo Ice Arena with a 3-0 quarterfinal loss to Framingham. All season long, the Panthers (14-9-1) have played with a target on their backs following last year’s historic run to the state title. Franklin battled through that adversity to win 14 games and claim another Kelley-Rex division crown, Saturday’s defeat means there will be no repeat for the program, which has made quite a bit of noise in its short time in Div. 1. “At the beginning of the season, we talked about we need to come with our best every night or we’re not going to win hockey games because we’re going to get everyone’s best,” said Franklin coach Chris Spillane, who finishes the season 10 wins shy of 300 for his career. The Panthers handled it pretty well against the Flyers, outshooting Framingham 26-23 for the game and dominating play in the second period. Franklin just could not find the final touch to get a puck past Framingham goalie Alex Moore. 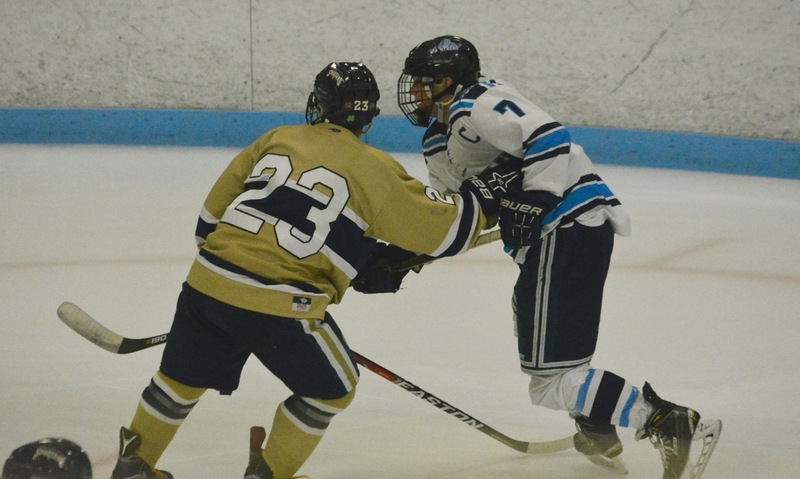 Adam Assad had the first opportunity for Franklin five minutes into the first period. He got his stick onto a pass by Luke Downie, but Moore blocked it with his pads. Matt Holmes had a chance three minutes later when he got to a rebound from a deflected shot but it was saved. Joe McInnis had the Flyers best chance on the break but Franklin goalie Cam Benham stood tall to block. Franklin stormed out of the intermission and outshot the Flyers 13-6 in the second period but found itself down by a pair of goals. Freshman Connor Opelt had a blast from the point saved by Moore early in the period and Jack McGrath had a couple chances to put the puck on net. On the Panthers first power play, Downie sent a rebound shot just wide of an open net. Then Holmes and Assad had a two-on-one rush that ended with Holmes’ shot from the left circle being saved by Moore. After all that pressure, Framingham caught the Panthers pushing up ice and stunned them with the opening goal. Ben Stefanini broke down the right wing, crossed the blue line, and then cut across the zone before firing a low shot past Benham into the bottom corner. Franklin continued to pressure and had another great chance when Assad received a pass from James Kilroe but again could not beat Moore. With 3:29 left in the second, Framingham got a power play and needed only 10 seconds to make it count. Stefanini found space in the slot and cut a pass against the grain to Mike Tersoni, who roofed his shot for a 2-0 lead. The Panthers had a minute of power play to start the third period and Spillane said that he talked in the locker room about not panicking and using their experience to battle back. Brendan O’Rielly had a snap shot that caromed off Moore’s shoulder, but Franklin could not create clear scoring chances. Benham kept the Panthers in it with a blocker save on a blast arrowing to the corner and then robbed Tersoni on a breakaway. With 2:08 left, the Flyers put it away. McInnis scored off an assist by Tersoni to make it 3-0 and seal the win. Spillane reflected on the season and the difficulty of being the defending champs. FRANKLIN, Mass. – Former Franklin goalie Sean Bertoni (Class of 2002) made his first return to his alma mater as a head coach on Saturday night, leading Oliver Ames into Pirelli Veterans Arena with a chance to take control of the Kelley-Rex title race. 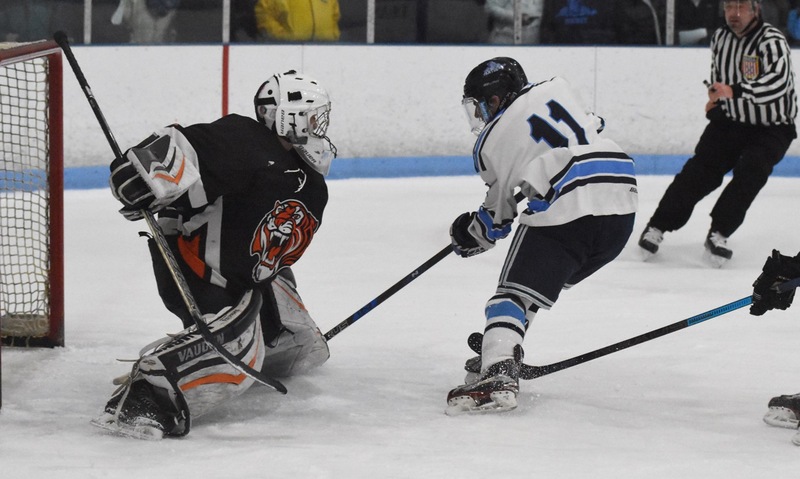 But it was current Panthers netminder Cam Benham that stole the headlines and the two points with a 40-save performance that helped Franklin claim a 4-1 victory and control of its own destiny as it seeks to clinch a sixth straight league championship. Benham needed to be ready right from the opening face-off because the Tigers came flying out of the gates with 18 shots in the opening period and used their speed to create host of great scoring chances. Eric LeBlanc set up Cullen Gallagher in front just a couple minutes in only for the sophomore to fire wide. Five minutes into the game, Brett Williams found Korey Sweezey in front alone but Benham made a point-blank pad save to keep the game scoreless. Rory Madden got free for a shorthanded chance but again Benham was up to the challenge. Franklin took advantage of those saves and of a four-minute major penalty to get the lead against the run of play. Tom Sicchio’s shot from the point was kicked aside by Zach Walsh (16 saves) but right to Matt Holmes and he knocked in the rebound. Right at the end of the first, Benham came through with a flurry of saves, batting aside five or six shots from the Tigers who were trying to head into the first intermission on even terms. Franklin settled down after the break and started the second much stronger and finding ways to slow down the speedy Tigers. Just a minute into the period, Adam Assad controlled the puck near his own blue line and took a hit to feed Sicchio pushing forward into the neutral zone. Sicchio drove into the attacking zone, dragged the puck past his defender and fired a shot into the bottom corner for a 2-0 lead. Three minutes later and the Tigers were stunned again, as a shot from the point by freshman Connor Opelt was redirected in front by Jeremy Miller and past the left pad of Walsh for a 3-0 lead. Gallagher had a chance from the slot to get one back for OA but fired over the bar and Williams set up LeBlanc in front for a tip towards goal that was blocked by Benham. The Tigers had the final seven shots of the second but trailed by three goals entering the third period. Within the first minute, Franklin had extended the lead to 4-0. Jack McGrath passed the puck across the blue line to Sicchio, who sent the puck towards net. Luke Downie redirected the shot from the slot and inside the post. The Tigers finally got on the board on a power play goal with 1:32 remaining. Benham made two saves but the second rebound popped out to Williams, who knocked it into an open net. OA got some energy to finish with another flurry, totaling 14 shots in the third period, but Benham stood tall again to ensure that the Tigers only got one on the board. Bertoni had previously returned as an assistant coach with the Tigers during the 2013-14 season and watched then Tigers goalie Jimmy Tierney make 40-plus saves for the win. He is now 1-1 coming back to his alma mater (where his father Bill Bertoni and his uncle Bruce Bertoni, who is still an assistant coach for the Panthers, are both members of the Franklin Hockey Hall of Fame). Franklin (9-4-0, 4-1-0) has jumped to the top of the league standings at the midway point of the league campaign. Next up for the Panthers is King Philip at Pirelli on Wednesday, while Oliver Ames (7-4-1, 3-2-1) will travel to Foxboro. FRANKLIN, Mass. – The last time that Franklin and St. Mary’s (Lynn) met on the ice, it was an instant classic. The Panthers and Spartans wowed the crowd at the Boston Garden in a dramatic, double overtime thriller that Franklin won to claim its first state championship in three decades. On Saturday night, the teams met again, this time in the smaller confines of Pirelli Veterans Arena, and the game played out very differently. Franklin got off to a great start, taking a lead just 1:23 into the first period, but for the majority of the next 43 minutes the game was dominated by the visitors. St. Mary’s took the lead by the end of the first and never looked back, pulling out a 7-3 victory and exacting a measure of revenge for last season’s title game defeat. The Panthers got off to the perfect start to the game. Jeremy Miller burst into the zone and had a shot from the right side kicked aside by St. Mary’s goalie Andrew LoRusso, but Adam Assad was following up the play and he knocked the loose puck into the open net. Shortly after the goal, the Spartans would be given a four-minute power play of which the first 90 seconds would be a two-man advantage. Thanks to a couple of solid kick saves by goalie Owen Ginley and strong defense that kept the visitors on the edges, Franklin managed to clear it off and gain even more energy. Unfortunately for the Panthers, the strong start could not be sustained. Colin Reddy tied the game with 3:18 left in the first when he tapped in Jason Loeser’s pass that slipped through the skates of a Franklin defenseman. Two minutes later, Kyle Ouellette flipped a pass towards goal that was knocked down into the slot by Mike Zampanti and knocked in by Anthony Bono. Ginley came through with a huge save on Bono after a mix up by the Franklin defense in the final seconds of the first, but he picked up an injury in the process and would be taken out for Cam Benham in the second. Franklin got off to a decent start to the second period with Miller setting up Zac Falvey only for LoRusso to deny him. Benham made a big save on Bono after a slip by the Franklin defense gave the St. Mary’s forward a breakaway, but was unable to stop a wraparound by Damon Maribito that made it 3-1. Benham stopped Maribito four minutes later on another breakaway and the Panthers nearly had an answer when James Kilroe was set up Noah Nasuti, but the shot was off-target. Twenty-four seconds after that chance a puck up the boards bounced between a pair Panthers and started a 2-on-1 break for the Spartans. Reddy scored his second off an assist by Mike Desmond. The fourth goal seemed to open the floodgates for St. Mary’s with Bono scoring on a blast off a face-off win to make it 5-1. Assad struck the post before the end of the second, but just three minutes into the third period Loeser flicked a wrist shot from the high slot through traffic that snuck inside the post. The Panthers showed some life in the final period helped out by several power play opportunities. Brendan O’Reilly set up Luke Downie (the hero from last March’s final at the TD Garden) but LoRusso again made the stop. T.J. Durkin had a goal disallowed a minute later when he knocked in Assad’s pass only for the officials to rule that the net was dislodged first. With 8:34 left to play, Kilroe followed up a rebound from Jack McGrath’s shot from the point to cut the lead to four with a power play goal. Dan Sheehan stopped a breakaway to keep it 6-2 and Cam Trask had a chance saved before Franklin added a third. Tom Sicchio drove to the red line and cut a pass across the crease that was tipped on net by Matt Holmes and tapped in by Downie. St. Mary’s sealed the win in the final minutes with a shot through traffic by Marc Zampanti. Despite the defeat, Spillane saw positives for his team from playing that level of competition. He said, “At the end of the day, it’s good for our kids in the long run. They’re a good team and we’re going to see teams just like this down the road, so we’ve got to be ready. Franklin (6-3) will return to Hockomock play on Wednesday when the Panthers travel to Aleixo Arena to play Taunton.